The Gorgeous Ladies of Arm Wre..
'I Need To Be Able To Accompli.. I know North Michigan Avenue well. I have worked on the world-famous Mag Mile for almost two years. 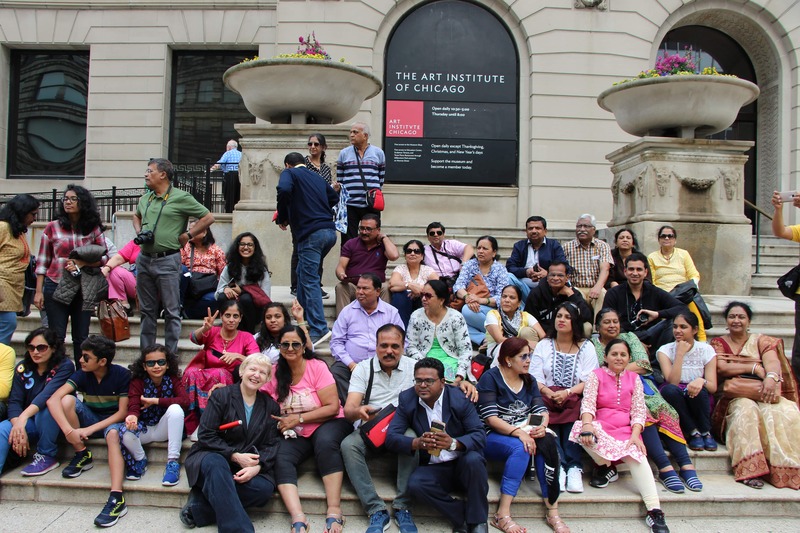 Tourists from around the world visit, pack shopping bags, walk through Grant Park and discover the joys of deep dish and Chicago dogs. The street brims with activity and fantastic noise. I, admittedly, did not know much about South Michigan Avenue, and a quick Google search left me unsatisfied. I found numerous property listings and stories on the Loop and River North, but it seemed the road south of the Loop had been forgotten. I knew one end of the street so well, but what about the other? Google did give me a starting point. 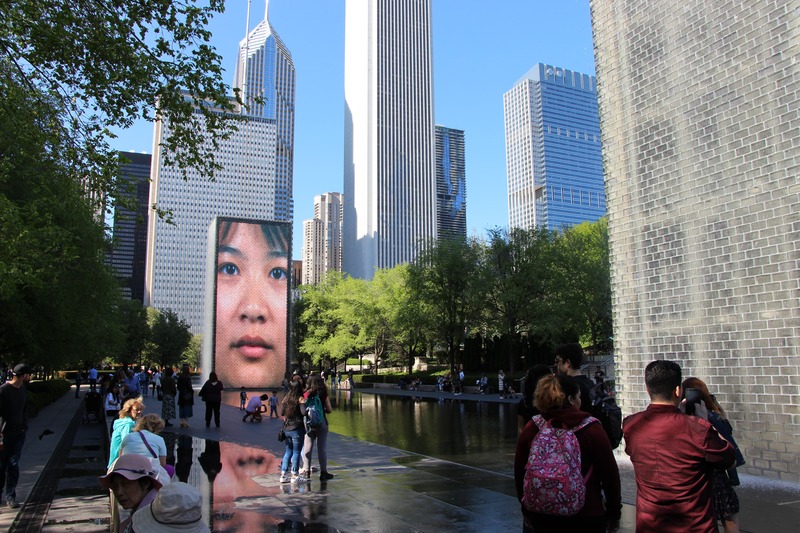 Beyond the popular stretch of road from River North through Grant Park, Michigan Avenue continues uninterrupted through five more miles of Chicago neighborhoods. 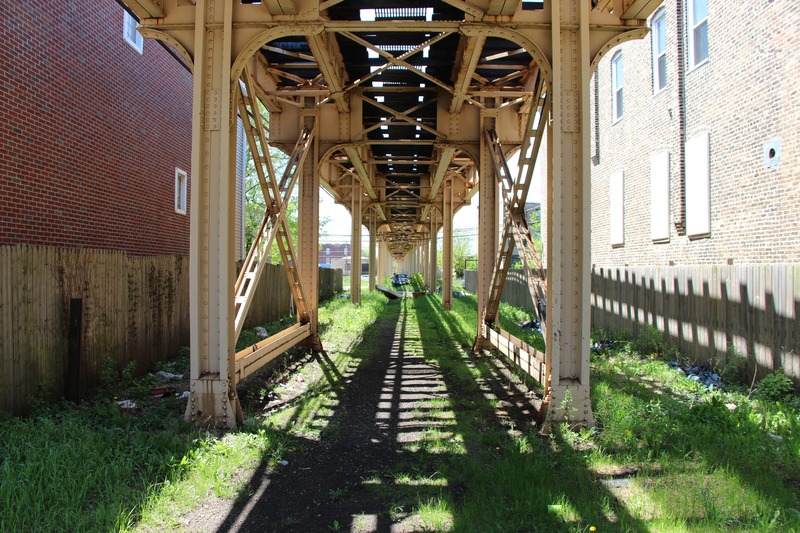 One of the most famous streets in the world dead-ends at the base of a railroad yard in South Chicago. It then reemerges south of the railroad tracks and continues all the way to the Calumet River on 127th Street. 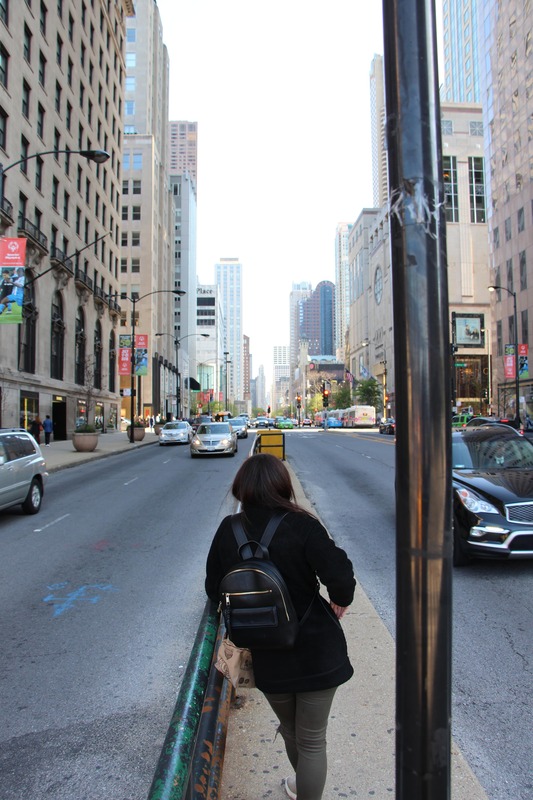 I decided to walk north on Michigan Avenue from its first dead end at 63rd Street to its opposite end at Oak Street in River North. I wanted to see where the avenue took me and document whatever I came across. This is the story of my 8.5-mile journey up Michigan Ave.
Map by Chris Silber, 14 East. Early Wednesday afternoons are quiet. I only hear the noise of the cars at the base of Michigan Avenue. Here is where the mighty road dead-ends into 63rd Street, a few blocks east of a Red Line stop and a few blocks west of a Green Line stop. The neighborhood is Washington Park, home of the large park bearing the same name and the DuSable Museum of African American History. I begin walking north on Michigan. The end of Michigan Avenue at 63rd Street. Chris Silber, 14 East. This part of Michigan Avenue is defined more by churches than storefronts. I pass several residential developments named after St. Edmund, and two large churches dominate the corner of Michigan and 61st Street. St. Edmund’s Episcopal Church has been operating from this location since 1940. St. Anselm’s Catholic Church across the street broke ground in 1924. As I continue, I pass an empty, fenced-in patch of grass. 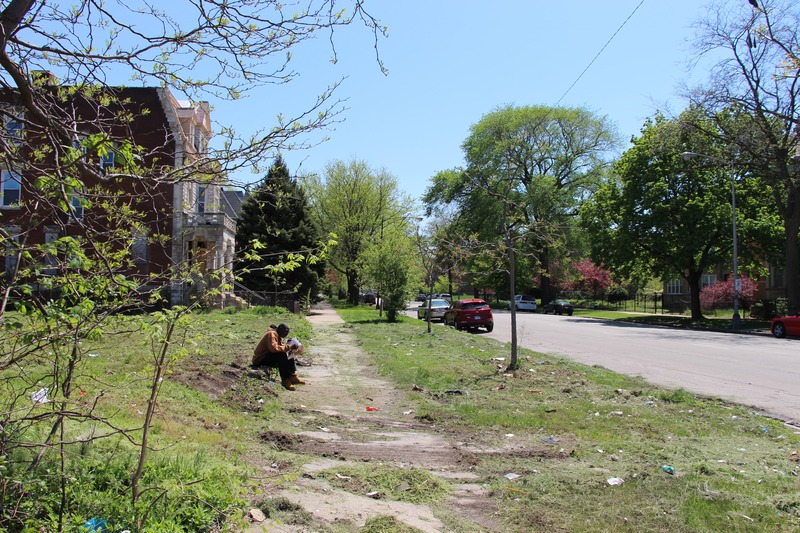 Several plots of land in Washington Park have no homes. At its height in the 1950s the neighborhood held 57,000 people – today’s population is somewhere around 12,000. The steep decline in population was caused by several factors, including changing industrial and commercial job centers in the city, white flight from South Chicago and city-mandated slum clearance. Many sites of former low-cost apartments were turned into non-residential community areas or simply left undeveloped. Today’s population is predominantly poor, with an average household income of $22,085. Almost 25% of the neighborhood’s housing units are vacant. I walk past the WBGX Gospel radio station and then go under L tracks a bit before 59th Street. There are no L stops in Michigan Avenue’s expanse, but the Green Line passes over the road twice. This specific track is the Ashland branch, which was originally constructed between 1905 and 1908. Sunlight passes through Green Line tracks passing over Michigan Ave. Chris Silber, 14 East. I pass a small food mart and a little Islamic Education Center, and arrive at the intersection of Michigan and Garfield. 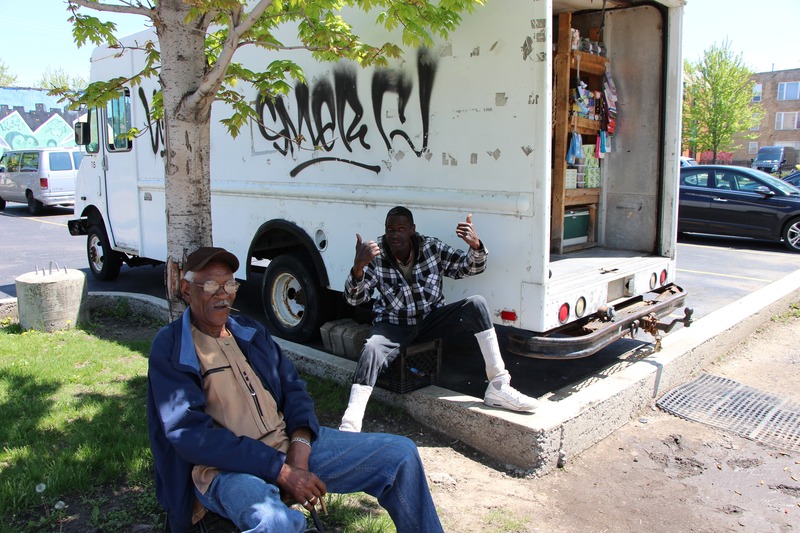 Two men are selling personal hygiene products from the back of a truck. Two men enjoying the weather and selling soap from the back of a truck. Chris Silber, 14 East. Across the street on Michigan is a large construction project. A mixed-income housing project focusing on the community’s art scene called the Cleo Art Residencies broke ground here in January with Mayor Emanuel in attendance. The city has invested over $7 million into this housing project. Cleo Art Residencies. Chris Silber, 14 East. It takes a few minutes to cross Garfield Avenue. After I do, I meet a few men doing yard work. One of them lives on the property. He said he loves the neighborhood and knows his neighbors. He claims the house next door to him used to be the residence of the legendary musician Nat King Cole. Did Nat King Cole really live in this house? It is hard to say. Cole lived in Chicago as a child, and his family moved a few times. Cole definitely did live and go to school less than a mile from this residence, and even lived on the corner of Michigan Avenue and 47th Street. Chris Silber, 14 East. I pass Greater Bethesda Baptist Church. The building was once a Jewish temple called the B’nai Sholom Temple Israel. The eastern part of the neighborhood was originally settled by German Jews in the 1890s. The outside is still adorned with the Star of David. At this time of day the neighborhood is quiet. The occasional pedestrian crosses my path, and a few neighbors converse on front porches. It is a nice spring day, so some people are simply sitting outside and reading. A man reads the Chicago Sun-Times by the sidewalk. Chris Silber, 14 East. At this point I have been walking for about an hour. As I reach the northern border of Washington Park on 51st Street, I stop and grab some lunch. 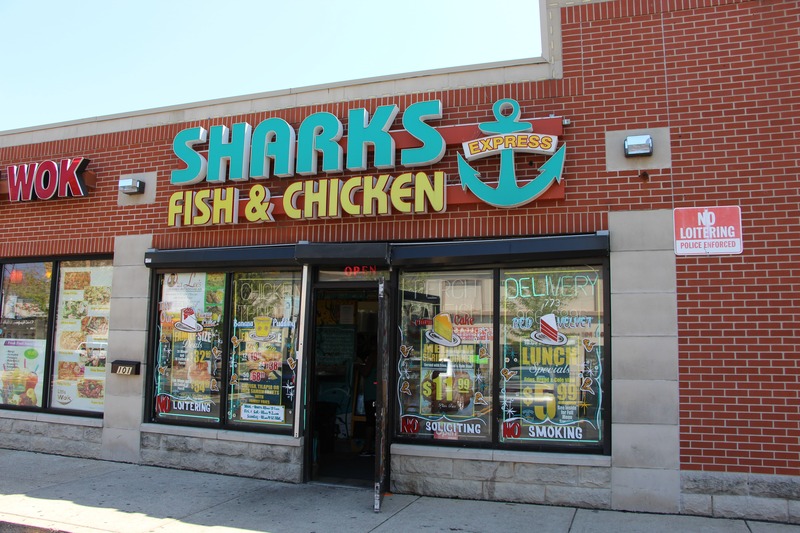 The restaurant is Shark’s Fish and Chicken, a chain prominent in South Chicago. I got 6 wings, fries and mild sauce. It is delicious. The cashier tells me to be careful. I’m carrying an expensive-looking camera and the area doesn’t have the cleanest track record regarding crimes and robberies. I finish my meal, listening to local patrons’ conversations as a midday soap opera plays in the background. I get up and go on my way. I cross 51st Street and officially enter the Grand Boulevard Community. Originally, there was a street called Grand Boulevard – the street has gone through two name changes since and was changed to Martin Luther King Drive after King’s death in 1968. 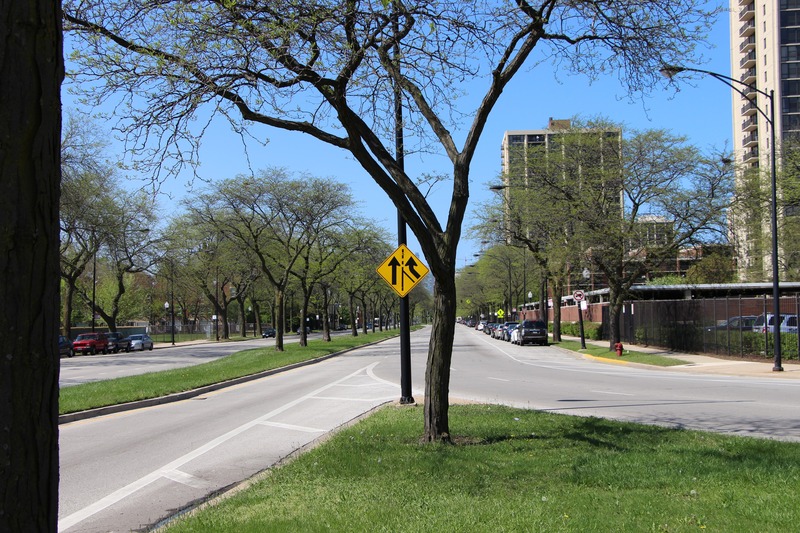 Grand Boulevard is the southernmost section of Bronzeville. 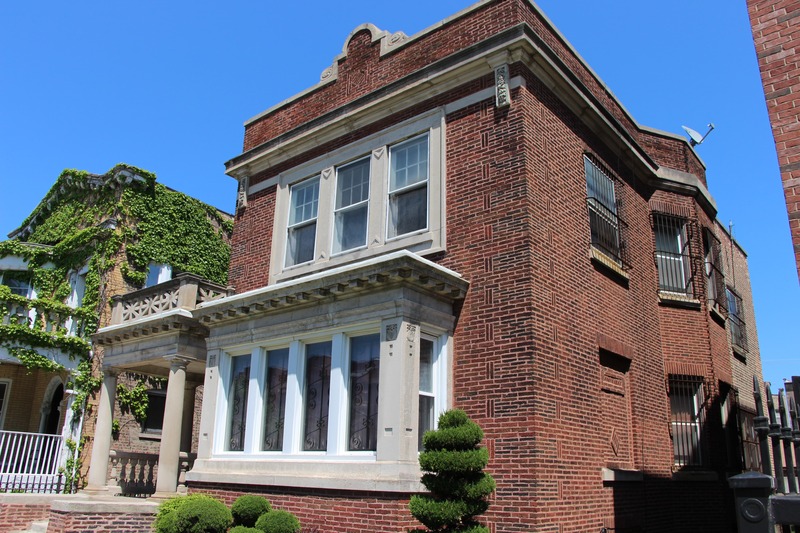 Grand Boulevard was at the heart of Chicago’s African-American culture in the early 20th Century: Richard Wright, Louis Armstrong and Dr. Daniel Hale Williams all called Grand Boulevard home. At its peak in the 1950s, over 100,000 people resided in the neighborhood, which is less than two square miles in area. Today the population is about 21,000 people. Like Washington Park, this stretch of Michigan Ave holds several churches. St. Elizabeth Church was home to the first publicly recognized African-American Catholic priest in the United States, Father Augustus Tolton. On the intersection at 45th I run across a relic of Chicago’s past. 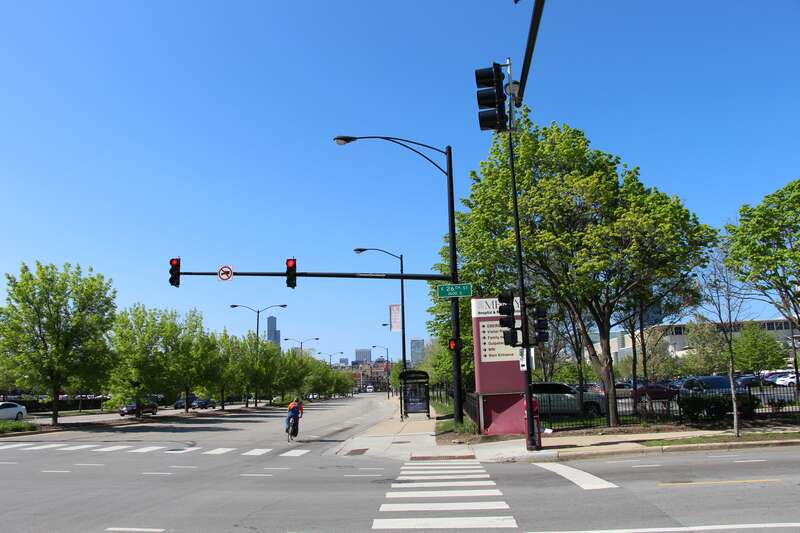 Two of Chicago’s richest meatpacking families — the Swifts and the Morrises — married into each other in 1890, and in 1892 they built a large mansion at this intersection. It has gone through the hands of multiple people and organizations in the past hundred years, including former 19th Ward Alderman John Powers, the Chicago Urban League and the Inner City Youth and Adult Foundation. The Swift Mansion. Chris Silber, 14 East. I come across an interesting business called Chi Turf. They sell artificial turf in the city and have different varieties named after neighborhoods. 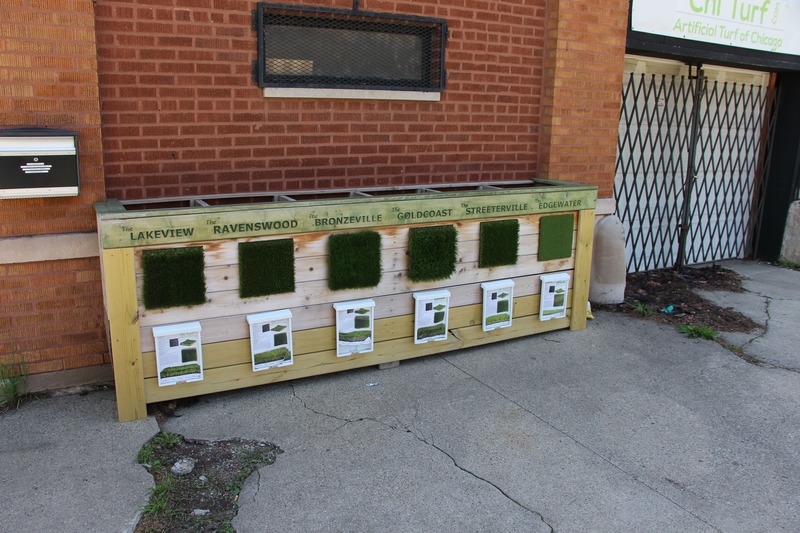 Turf samples on the sidewalk outside of Chi Turf. Chris Silber, 14 East. The Green Line passes over again at 40th Street and I come to the edge of Grand Boulevard at Pershing Road. 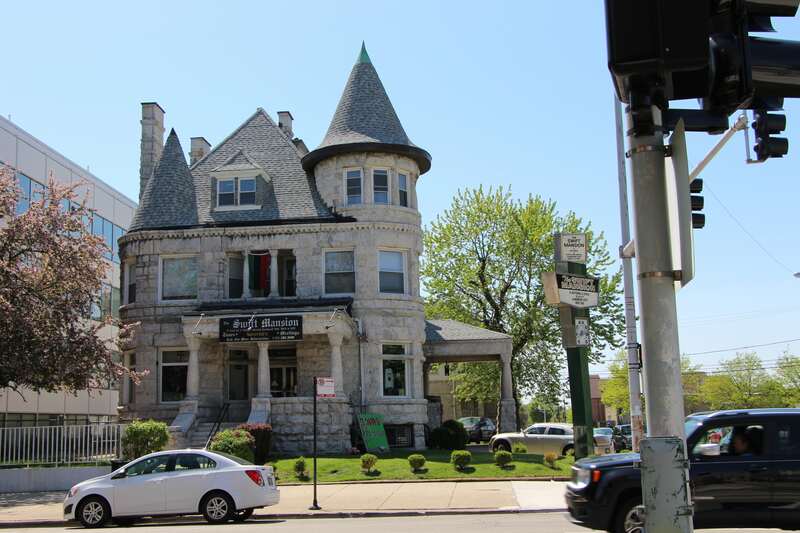 The Douglas community encompasses the northern section of Bronzeville. The community is named after famous Illinois senator Stephen A. Douglas, who ran for the presidency against Abraham Lincoln in 1860. The Senator owned seventy acres of land between 34th and 35th streets in the 1850s. During the Civil War the Union built Camp Douglas, a training facility and Confederate prison, between 31st and 33rd street. I come across The South Side Community Art Center early on in my tour of Douglas. The center was opened during the Great Depression in 1940 with the help of the Works Progress Administration’s Federal Art Project. First Lady Eleanor Roosevelt gave the dedication speech at the same building the center calls home today. 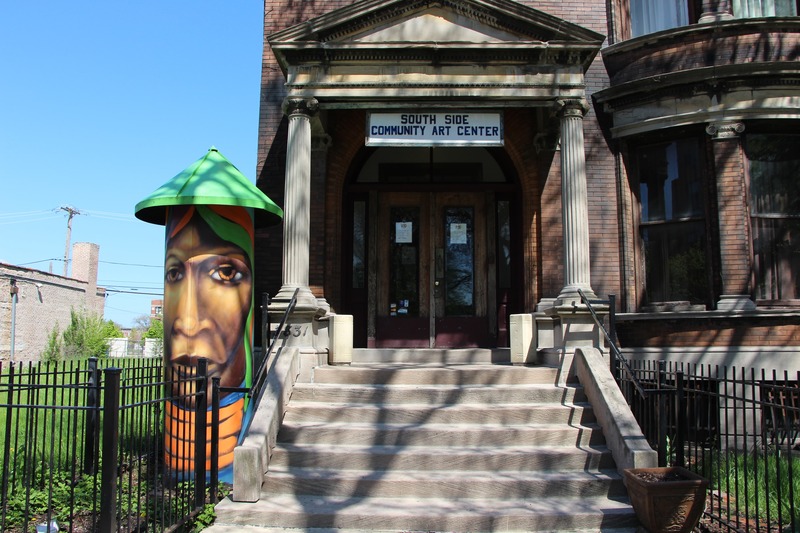 The South Side Community Art Center is the only remaining art center created by the Federal Art Project. Chris Silber, 14 East. Just north of 36th Place I come across the massive Chicago Public Safety Headquarters. 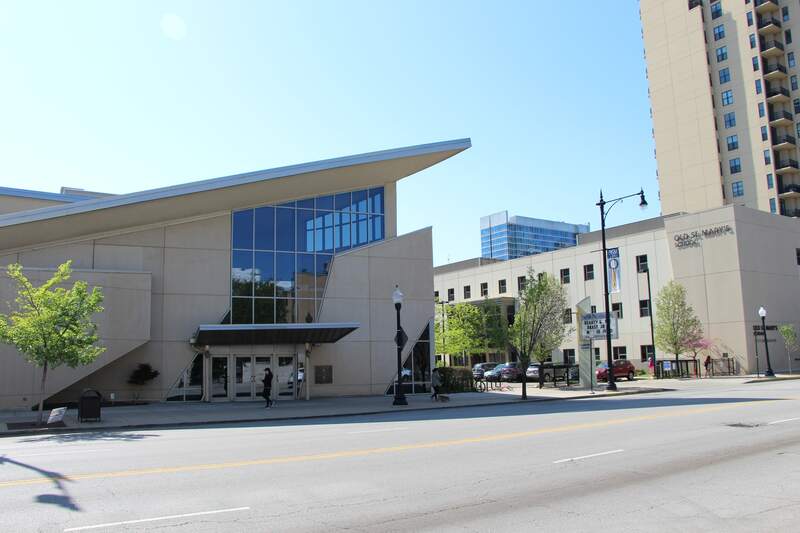 When it was built in 2000, it was considered one of the most technologically advanced police headquarters in the country. Originally just the headquarters for the Chicago Police Department, the Chicago Fire Department also moved in in 2011 as a cost-saving measure by the city. WGN reporters prepare to do a video shoot outside the building as I walk by. Just north of the Headquarters is the De La Salle Institute, a preparatory school with an incalculable influence on Chicago. De La Salle Alumni include five Chicago mayors: Frank J. Corr, Martin H. Kennelly, Richard J. Daley, Michael A. Bilandic and Richard M. Daley. Students loiter outside the school as I walk by. 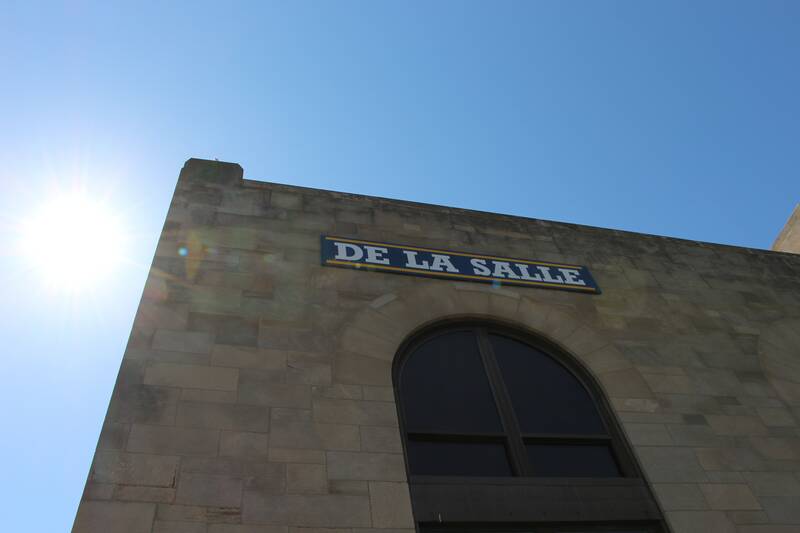 The sun shines over De La Salle’s southeast corner. Chris Silber, 14 East. The Illinois Institute of Technology’s campus Borders Michigan Ave to the west. IIT first opened its doors in 1893 and its current campus was largely the work of world-famous architect Ludwig Mies van der Rohe. On this spring morning the facilities are empty and the grounds are green. The university’s school year ended in early May. At 31st Street I meet a woman with a reflective vest and aviator sunglasses. 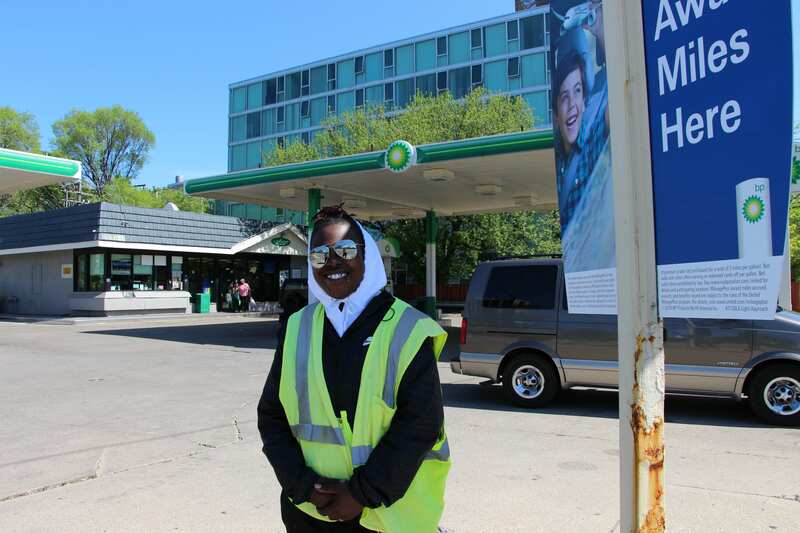 She works for Safe Passage Chicago, a city program that provides a safe route home for students before and after school. She sees my camera and is happy to pose for a picture. A Safe Passage worker enjoying the spring weather. Chris Silber, 14 East. 31st Street is also the point where Michigan Ave finally becomes a two lane road, where it continues as such through its endpoint in River North. The beginning of the North Route. Chris Silber, 14 East. At 28th Street I meet a bus driver who is taking a break to stretch out. His name is Patrick Coogan, He says he only works as a city bus driver part-time. He is also a location scout for NBC’s television shows and owns an apartment building in the city. I tell him I grew up in Ohio, and he proudly informed me that he once met the legendary Ohio State football coach Woody Hayes. 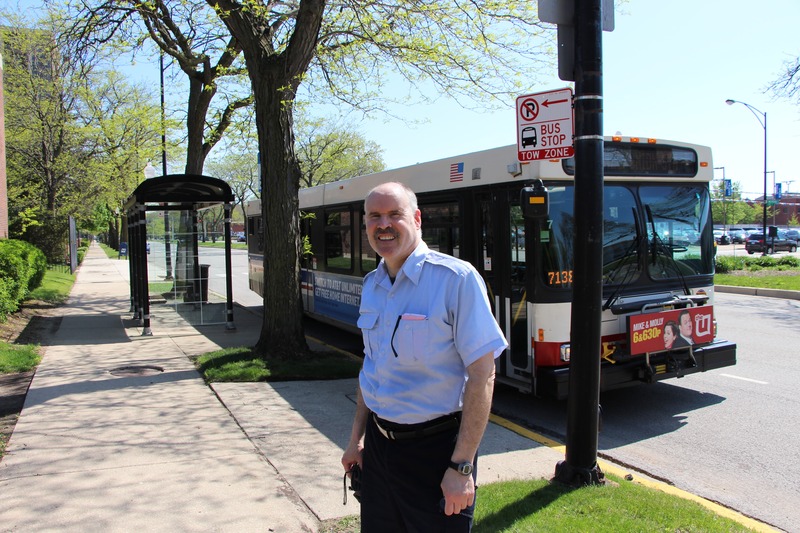 Patrick Coogan stands by his bus on the #1 route stop on Michigan and 28th Street. Chris Silber, 14 East. The Community of Douglas comes to an end at 26th street. This street also marks the end of Bronzeville. The End of Douglas at 26th Street. Chris Silber, 14 East. 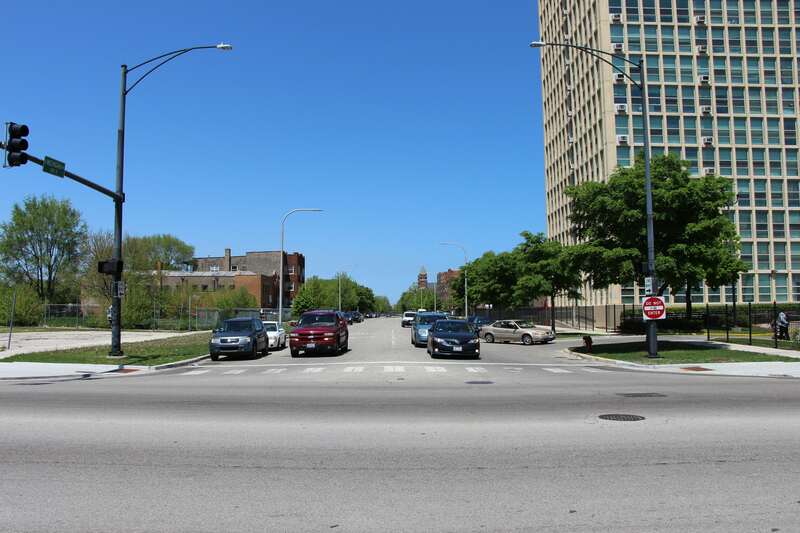 It is in the Near South Side Community that Michigan Avenue’s surroundings grow significantly in height and density. The area has had an ever-changing presence in the city. Once the site of a Native American settlement, the community was settled by blue-collar Illinois & Michigan Canal workers in the 1850s. Wealthy businessmen built mansions in the community later in the 1800s and subsequently left at the turn of the century for quieter residences further from the Loop. 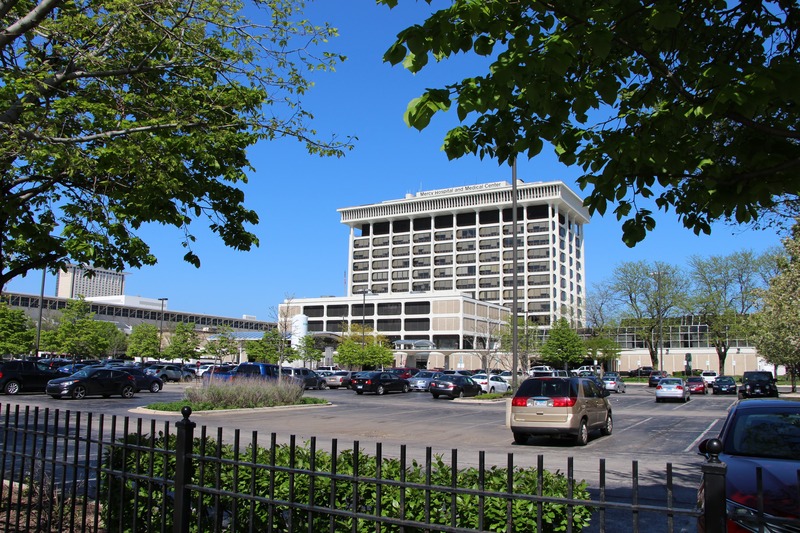 The Near South Side then became a vice district with a distasteful reputation for gambling and prostitution leading into World War I.
Mercy Hospital and Medical Center just north of 26th Street was the first chartered hospital in Chicago, with roots tracing back to 1852. President Theodore Roosevelt was treated for a gunshot wound here. Chris Silber, 14 East. The community hosted the 1933 World’s Fair at the height of the Depression. After decades of population decline from the 1960s to the 1980s, a real estate boom ushered in a large population increase from the 1990s to present day. I pass over the Stevenson expressway and see McCormick Place, Chicago’s main convention center, to the north. The expressway lies mostly over the same Illinois & Michigan Canal that the original settlers of the area dug. I now enter into Chicago’s historic Motor Row district. During the auto boom in the first half of the 20th century, the strip of Michigan Ave from 14th to 22nd Street became the go-to location in Chicago to buy and repair cars. Motor Row has an atmosphere quite different than Michigan Ave in Bronzeville. Chris Silber, 14 East. I come across a brick building that is famous for a few reasons. Built in 1936, it originally housed the exclusive Illinois Automobile Club. 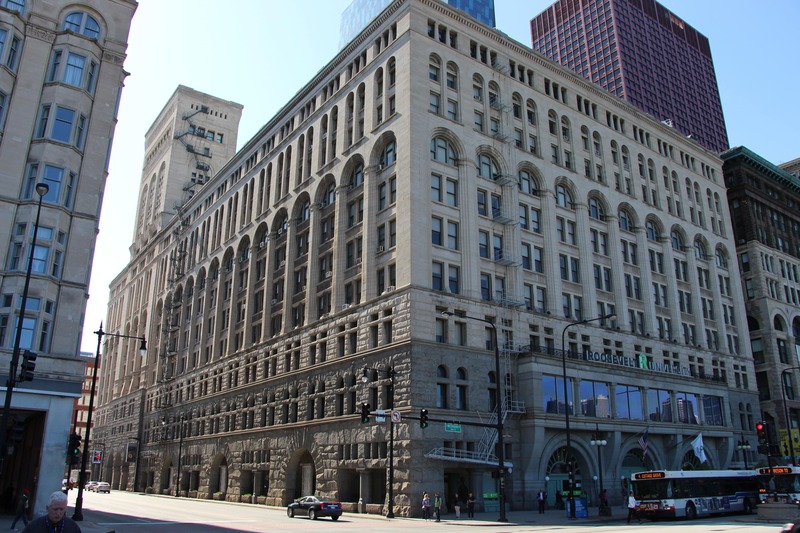 It later housed the Chicago Defender Headquarters and now acts as an event production space. There are notably fewer places of worship in this community. Second Presbyterian Church is the first of only two churches I pass in Near North Side. 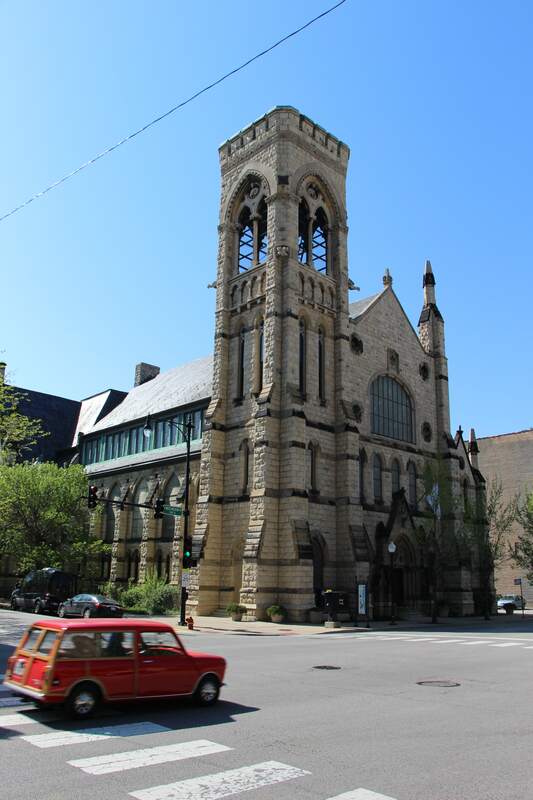 Second Presbyterian Church has been operating from various locations in Chicago since 1842. The current building was built in 1872. Chris Silber, 14 East. I have been walking for a long time now and I am getting a bit tired. The sun is unrelenting, my hand is cramping up from taking pictures. I stop at a little store called Green Leaf Market just south of 16th street and buy a can of iced tea. I come across Old St. Mary’s Catholic Church next. The church was constructed in 2002, but the St. Mary’s Parish has been operating since 1842, when St. Mary’s Cathedral was built in the Loop. The church opened an elementary school in 2004. Old St. Mary’s Catholic Church and School. Chris Silber, 14 East. Near South Side is bustling with construction. 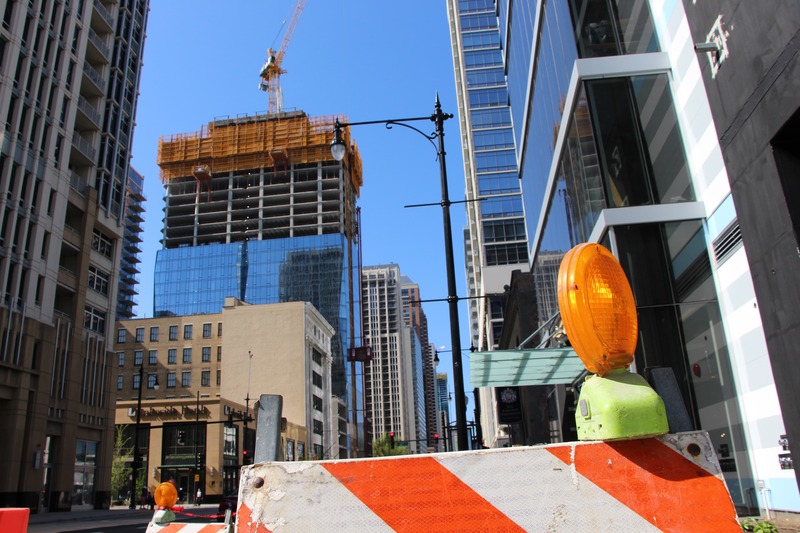 A 47-story high-rise is under construction between 13th and 14th streets. 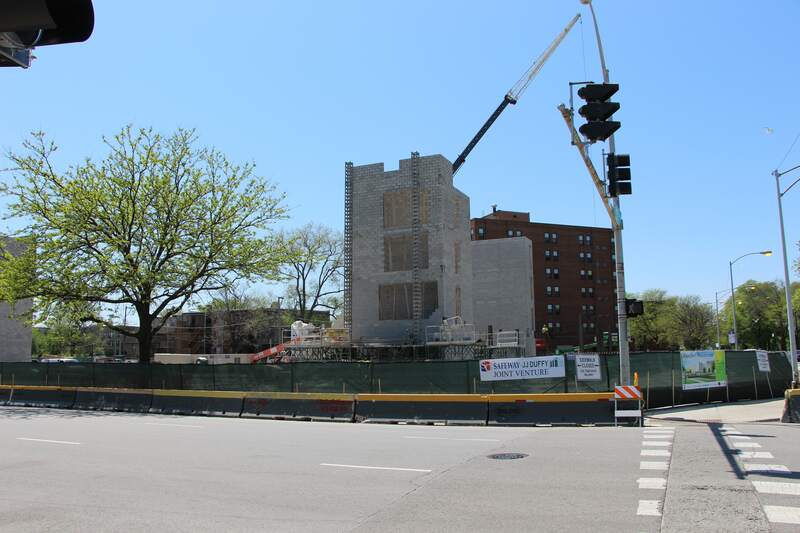 The building will hold over 500 rental apartments. A wonderland of construction. The permits for the construction project pictured were an estimated $119 million. Chris Silber, 14 East. I reach the end of the Near South Side at Roosevelt. From the intersection Grant Park and the towers of River North come into view. This part of the walk is beautiful. The historic center of the largest city in the Midwest towers to the left and the greenery and monuments of the park to the right. Soon I pass the Auditorium Theatre. The theater was designed by the famous architecture due Adler and Sullivan and completed in 1889. It played a large role in Chicago being named the site of the 1893 World’s Fair. The Auditorium Theatre was the marvel of its time. It was the tallest building in the city when it was constructed. The building had electric lighting and air conditioning, and the stage had perfect acoustics. Chris Silber, 14 East. The streets are getting busier as I continue north. The street comes to life in the warmth while food vendors pile on side streets. I reach the Art Institute, which is buzzing with people. A group of tourists are posing for a photo and ask me to take a few pictures with their phones. I ask a man where they’re from. “We’re Indian!” is all he says. The Loop continues after Grant Park for a few blocks and the skyscrapers overwhelm the senses. Light reflects off the windows and filters down onto the street. The Crain Communications Building looks stunning in the bright afternoon. Chris Silber, 14 East. I meet a man in a wheelchair and chat with him for a minute. “My name’s Albert, like Fat Albert,” he says. 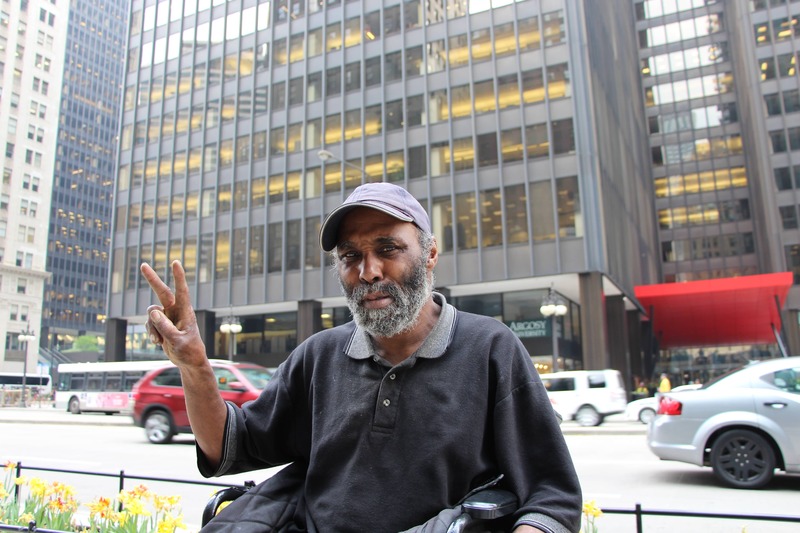 Albert holds up a peace sign across the street from Michigan Plaza. Chris Silber, 14 East. The Loop ends at the Chicago River. Michigan Ave passes over the DuSable Bridge into the Near North Side and marks the beginning of the Magnificent Mile. 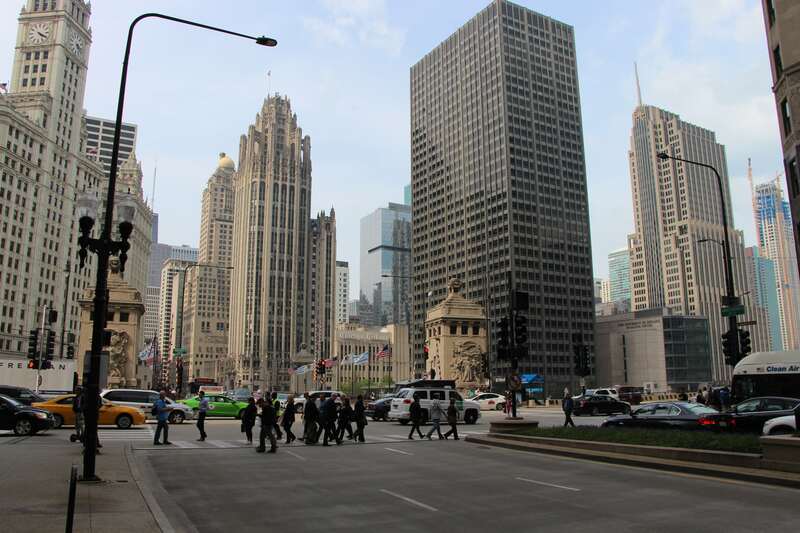 The intersection of Michigan and Wacker is one of the most famous views in the city. One can see the Wrigley Building to the left, Tribune Tower in the center and the John Hancock Center peeking in from the background. Chris Silber, 14 East. After four hours of walking I finally reach River North, the southeastern section of the Near North Side community. This is the center of Chicago retail and home of some of the city’s most famous buildings. 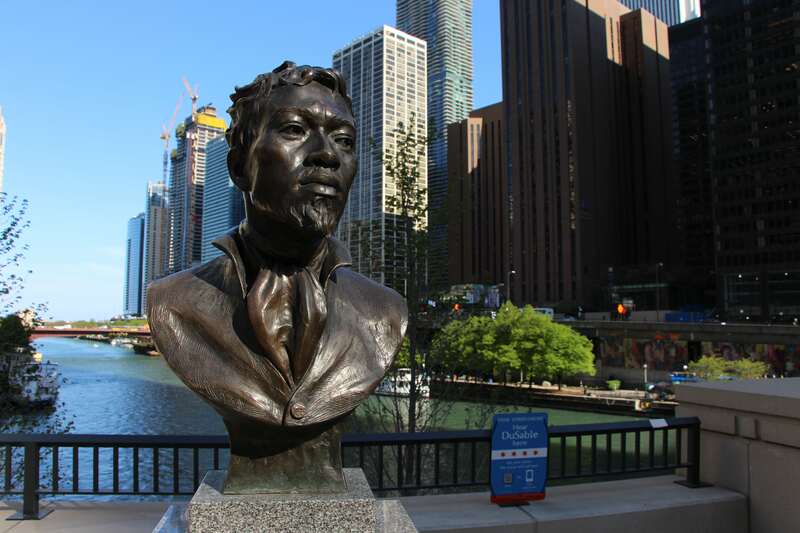 I first visit the bust of Jean Baptiste Point du Sable, historically regarded as the first resident of Chicago. Point du Sable settled at the mouth of the Chicago River and established a successful trade settlement in the 1790s. Though he sold his property in 1800 and moved to the Missouri area, his settlement eventually blossomed into modern Chicago. Point du Sable’s sculpture overlooks the Chicago River and DuSable Bridge. Chris Silber, 14 East. The wide, pedestrian-friendly sidewalks are lined with flowers and greenery. The rain from the day before seems to have livened up the plant life, which stands in contrast to its metallic and concrete surroundings. 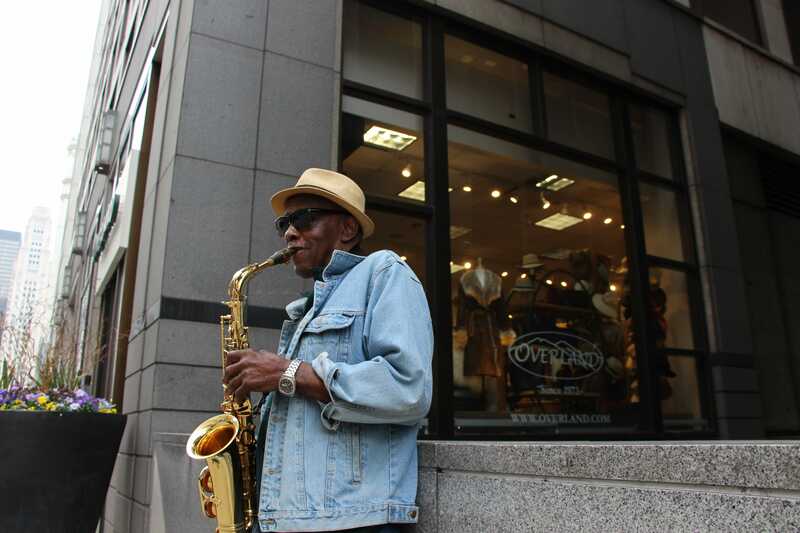 A saxophonist named Armando plays tunes on the sidewalk. Chris Silber, 14 East. I walk by a Rolex store and think of the wide range of places I have walked through today. A few short hours ago I was walking along vacant lots and now I am passing stores that sell watches worth more than my college tuition. 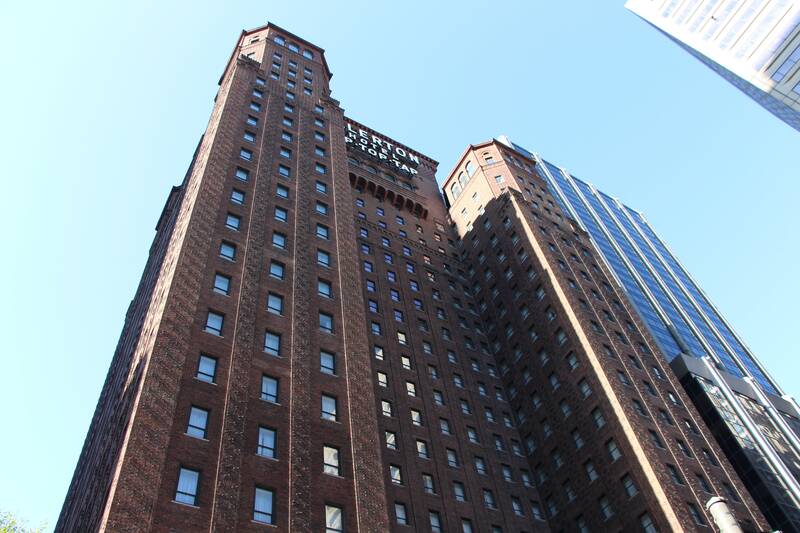 The Allerton Hotel on Huron Street was built in 1924, and was the first Chicago skyscraper to have pronounced setbacks as it got taller to conform with a new zoning ordinance passed in 1923. The famous brickwork of the Allerton regally towers next to the glass and steel skyscrapers of the modern Mag Mile. Chris Silber, 14 East. I pass the Old Chicago Water Tower and come across the John Hancock Center. The Hancock Center was the second-tallest building in the world when it was completed in 1969. Its bold shape and X-braced exterior are prominent in nearly every skyline photo of the city. Michigan Ave is Chicago’s stage. 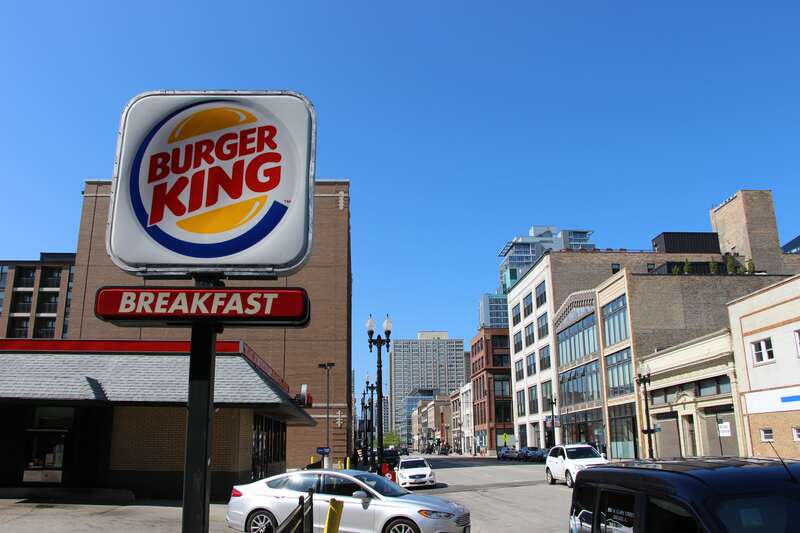 It is the setting for Chicago’s greatest triumphs and humble roots. Millions of feet have walked its sidewalks, from the men selling soap on Garfield Blvd to the birthday girl outside the Water Tower Place. 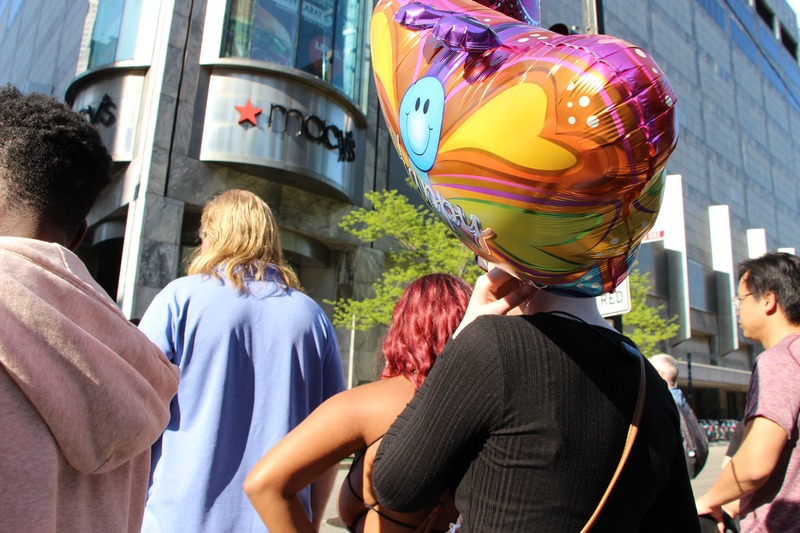 A girl holds a birthday balloon outside of Macy’s at Water Tower Place. Chris Silber, 14 East. I come to Michigan Avenue’s end as it intersects with Oak Street and dissolves into Lake Shore Drive. I walked through the streets of six communities, learning about their history and meeting their residents along the way. As I look south at the road I just spent my day walking up, I cannot help but feel more connected with the city I call home. The end of the road. 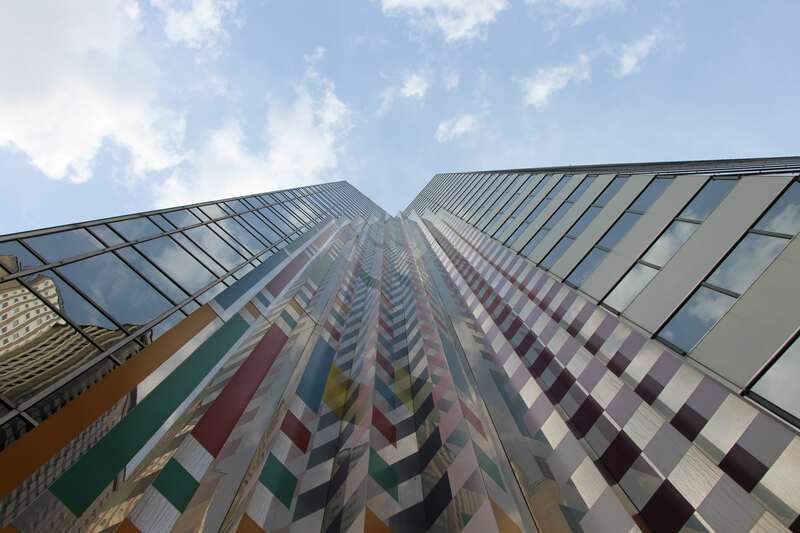 Chris Silber, 14 East.